Thus, the litany immediately divides between catholic and national parts. Keeping in mind the part is never greater than the whole, the petition for the church cahtolik naturally comes first. But after the prayer for our universal body, the 1559 litany moves to the provincial or national domain. The national church, of course, begins with England’s supreme head, the Crown. Descending from there, the suffrage pleas for his seed, often both those nearest in birth and marriage to the throne. The litany then continues downward to the Bishops, likewise greater nobility, who were next to adjure for the church. Alongside them were then the Lords of Council who could likewise be regents or protectorates to the King either his absence or by immaturity. Then came the magistrates (judges, commons), and, last, the faithful. I believe the homily gives some insight toward Cranmer’s alteration of the Sarum litany. For Cranmer, and especially the Anglican divinity of the 17th century, the church doesn’t absolutely stand apart from the commonwealth but is a peculiar estate within. Yet, all estates are ruled by the Prince, “The King’s Majesty hath the chief power in this Realm of England, and other his Dominions, unto whom the chief Government of all Estates of this Realm, whether they be Ecclesiastical or Civil (Article #37). Revolution and Apostasy: The American revolution changed the English transposition of church-state. The prayer book blames the absence of royal Supremacy upon American ‘circumstances’ (p. vi, The Book of Common Prayer). Episcopalians properly attended these ‘circumstances’ by omitting those prayers touching Crown and nobility. However, the American bcp revision of 1928 went further than baring mention of royalty from the book. Instead, the U.S. Presidency was inserted and curiously placed in the old rank of the Crown. This is wrong for a couple reasons. 1. re-use the1789 or 1892 versions. 2. simply re-edit the American 1928 suffrages by moving the Presidency back to its original place with common magistrates as found in the 1662 (or older bcp’s). In effect, this would make the American more ‘ catholic’ returning more or less to the same order (minus the Pope) as the Sarum where the state is below the church rather than the other way around. “O Lord God; and that it may please thee to rule and govern thy holy Church universal in the right way…That it may please thee to illuminate our Bishops, Priests, and Deacons, with true knowledge and understanding of thy Word; and that both by their preaching and living they may set it forth, and show it accordingly… That it may please thee so to rule the heart of thy servant, The President of the United States, that he may above all things seek thy honour and glory…That it may please thee to bless and preserve Christian Rulers and Magistrates, giving them grace to execute justice, and to maintain truth…That it may please thee to bless and keep all thy people“. While AR has no overwhelming interest in using the state prayers for monarchy, the idea of regency within Supremacy needs to be preserved. There is no question among conservative Anglicans today that the English Crown has become irresponsible in church responsibilities. It is also very apparent the the Primates and Archbishoprics follow a similar path. 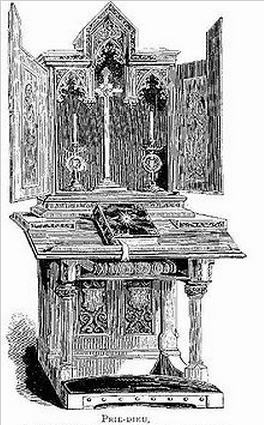 Nonetheless, the litany’s faldstool (as a symbol of authority within the church) shows that Anglicans have a chain of command, and when the stool is abducted, their is a proper order by which a lower estate ought to function as regent or “defender of faith” until a better day. Obviously, Keble isn’t despairing prelacy in the Church but the danger catholicism faced after by two democratizing events: 1) parliamentary supremacy after 1700 which always threatened the church; and 2) electoral emancipation in 1833 allowing non-Anglicans to sit in parliament. Some thoughts: Anglicanism today is likely in worst straits than at Keble’s time. The question of authority whether in the Lambeth Communion or amongst Continuing Churches is endemic. Continuing clergy over the last forty years have manage to secure (sometimes irregular) bishoprics so laity might roost in relatively safe dioceses. Meanwhile, Canterbury-aligned churches are breaking traditional diocese boundaries by forming parallel dioceses on the basis of theological affinity rather than territory. Though we are not at the point of needing a lay communion, the Litany instructs where Anglicans might go after estates successively fail. We might also consider the rare and in extremis powers an estate may employ in lieu of another’s abduction. Thus we have a chain of command, and it might be traveled either downward or upward according to contingency. The crisis of authority is not so much that Anglicanism can’t work, but what respective estate will step-in vis-a-vis Anglicanism’s historic ‘chain of command” now that the Archbishops and Crown have created a vacuum of authority, ruling in their stead? We might call this ‘regent theory’. The major problem in the Church which has brought us to this present unpleasant pass has been nothing less than the willfulness of the clergy in deciding what they should or would do in terms of what the prayer book required of them. They have sworn to do one thing but done another and their bishops have failed to discipline or depose them for their failure to do precisely what they promised in order to be ordained. Again, is the Church really present where the daily offices and the litany are not said publicly. And however difficult that may be in the Continuum with the few places where they have building or rooms to which they have daily access, the truth must also be faced that few of our clergy truly believe they are required to keep the discipline and worship of the traditional prayer books.